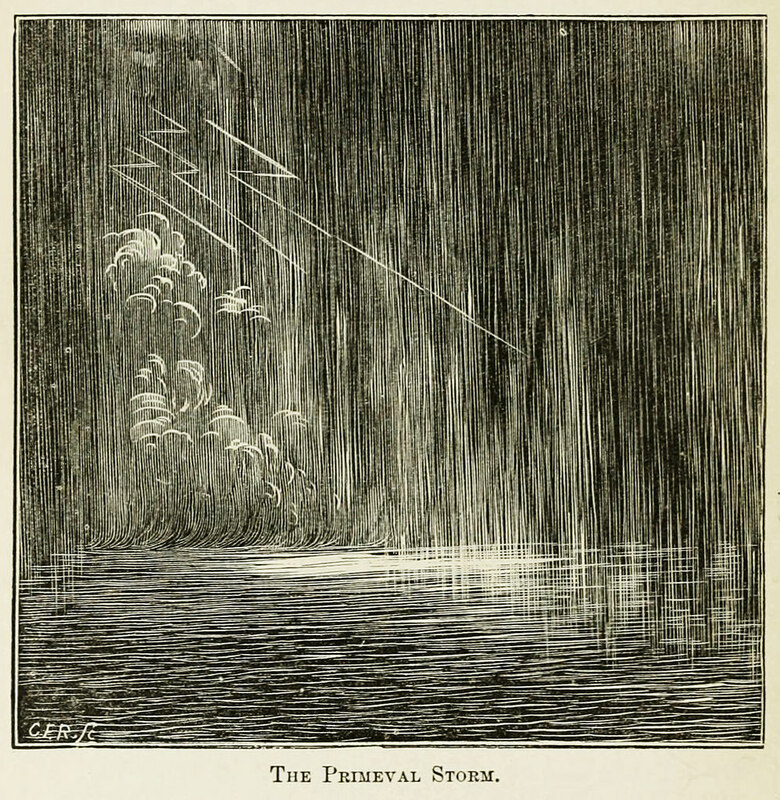 The magnificent civilization of Atlantis shattered and plunged beneath the sea in February 1882. Or, to be more precise, the eccentric American Ignatius Donnelly published Atlantis: The Antediluvian World, the first book of a trio that would highlight a series of imaginary catastrophes. The book — a rehash of Atlantis speculation supported with flood myths from around the globe — was an instant success and has continued to draw readers over the decades. Newspaper reviews were laudatory, Harper and Brothers issued seven printings in the first year, and W. E. Gladstone took time out from pondering the Irish Question to write Donnelly a four-page fan letter. It was easy to imagine the worst in 1882. President James Garfield had been assassinated only months earlier — the second president shot to death in sixteen years. The economy was dropping into a new recession even as it struggled to emerge from the dark years of the 1870s. Farmers in Donnelly’s state of Minnesota were especially hard hit. In September, thirty thousand New York workers marched in the nation’s first Labor Day parade, remembering the violent railroad strike of five years earlier. Atlantis might have seemed to offer relief from the turmoil. Its densely packed pages of pseudoscience and mythology recounted the supposed golden age of the lost continent and world-spanning civilization first mentioned by Plato. But the subtext was the fragility of a golden age. When Atlantis sank beneath the waves in a global cataclysm, a powerful and nearly perfect society perished. For Donnelly, Atlantis was a model and mirror for the United States, where urbanization, industrialization, and the accumulation of vast wealth were a social deluge destroying the nation’s own golden age of the agrarian frontier. It was personal. That mythicized American frontier had promised much to Donnelly and delivered less. He began as an enthusiast who tried to make it as a farmer, land developer, and politician in a nation that seemed to offer unlimited opportunity but was riven by social and economic conflicts. He was also a prickly character. He started out as a lawyer in Philadelphia, but quarrels with clients and family propelled him to Minnesota in 1858, just as it was being admitted as a state. He plunged into land speculation and politics. Nininger City, an undeveloped townsite seventeen miles from St Paul needed only his promotional talents to become a major river port and make Donnelly a rich man, or so he hoped. Alas, few residents came. 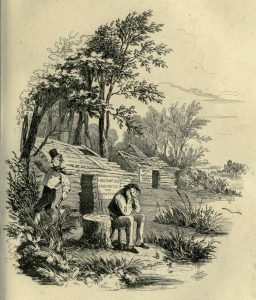 Readers of Charles Dickens might think of Martin Chuzzlewit’s ill-fated visit to Eden, another Mississippi Valley “city” that never matched its press notices. 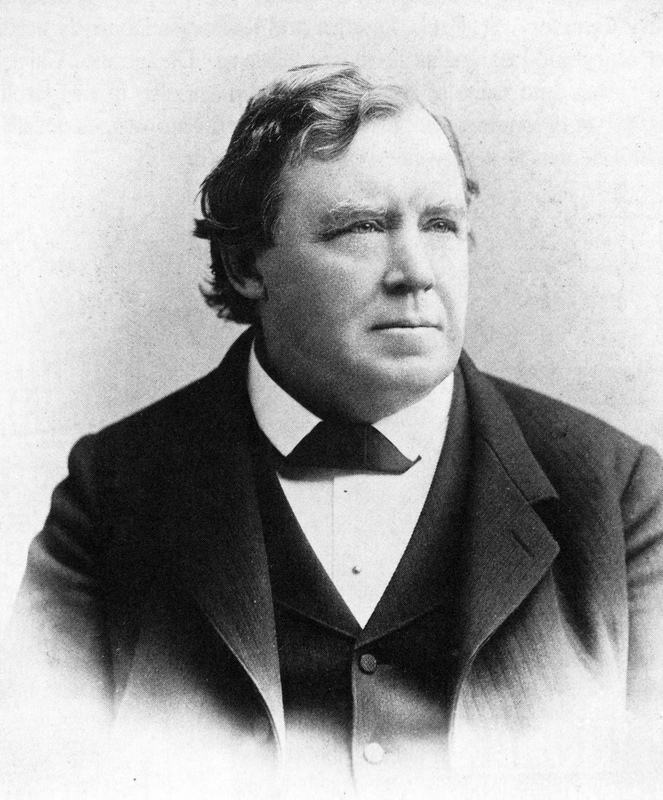 Undeterred, Donnelly got in with the new Republican Party and was elected Lieutenant Governor of Minnesota at age twenty-eight, and then served as US Congressman for three terms from 1863–68. Not a man to hold his tongue, however, he split with Republicans because they were becoming conservative, returned to his lonely mansion at Nininger, ran an anti-monopoly newspaper, and tried out a series of third parties and splinter factions, which failed to propel him to the offices he thought he deserved. Those death shrieks were just the start for a writer who came to specialize in cataclysms that could rend entire cities, ravage entire civilizations, or destroy entire continents. As his ambitions and plans repeatedly fell short — his agrarian golden age failed to materialize — he took up his pen to explore increasingly extreme visions of apocalypse. 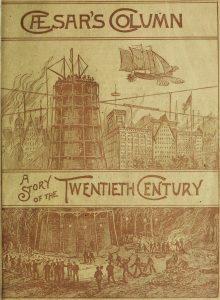 First came “factual” accounts of two very different prehistoric disasters — Atlantis (1882), followed by Ragnarok: The Age of Fire and Gravel (1883) — and then, seven years later, Caesar’s Column: A Story of the Twentieth Century (1890), a futuristic novel that major publishers rejected as dangerously revolutionary. The description of disaster in Atlantis was relatively low-keyed. Donnelly did not bother to recreate the catastrophe in his own words because he could cite deluge myths and legends from all over the world. 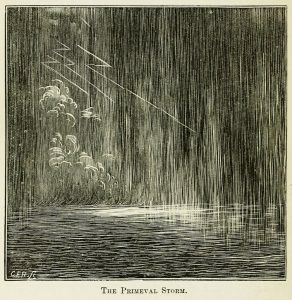 An event, which in a few hours destroyed, amid horrible convulsions, an entire country, with all its vast population — that population the ancestors of the great races of both continents, and they themselves the custodians of the civilization of their age — could not fail to impress with terrible force the minds of men, and to project its gloomy shadow over all human history. And hence, whether we turn to the Hebrews, the Aryans, the Phœnicians, the Greeks, the Cushites, or the inhabitants of America, we find everywhere traditions of the Deluge; and we shall see that all these traditions point unmistakably to the destruction of Atlantis. In Ragnarok Donnelly went extraterrestrial. The book shows a cataclysmic mind at work, with its core assumption that change comes via revolution, upheaval, and calamity. In Atlantis he had riffed on a well-known story. Now he invented his very own cataclysm. Louis Agassiz, Charles Lyell, and other geologists had been replacing a catastrophe-driven history of the Earth with gradual processes, but Ignatius Donnelly was having none of that. Churning out four-hundred-fifty pages in seven weeks (rewriting was not his thing), he described a supposed cosmic disaster in which a comet grazed the Earth, showering it with “the Drift”, his name for the layer of sand, gravel, and soil that lies over our planet’s bedrock. Atlantis had been a financial success, throwing off enough income to encourage more writing. Ragnarok was a different story. It started off well, but sales crashed after a few weeks and its author grew frustrated with New York’s literary and scientific establishments (his publisher failed to push the second book; scientists ignored or ridiculed the cometary catastrophe). E. L. Youmans, the editor of Popular Science Monthly and the nation’s most influential science journalist, called Ragnarok “absurd” (although it may have influenced the similarly crackpot thesis of Immanuel Velikovsky in Worlds in Collision in 1950). 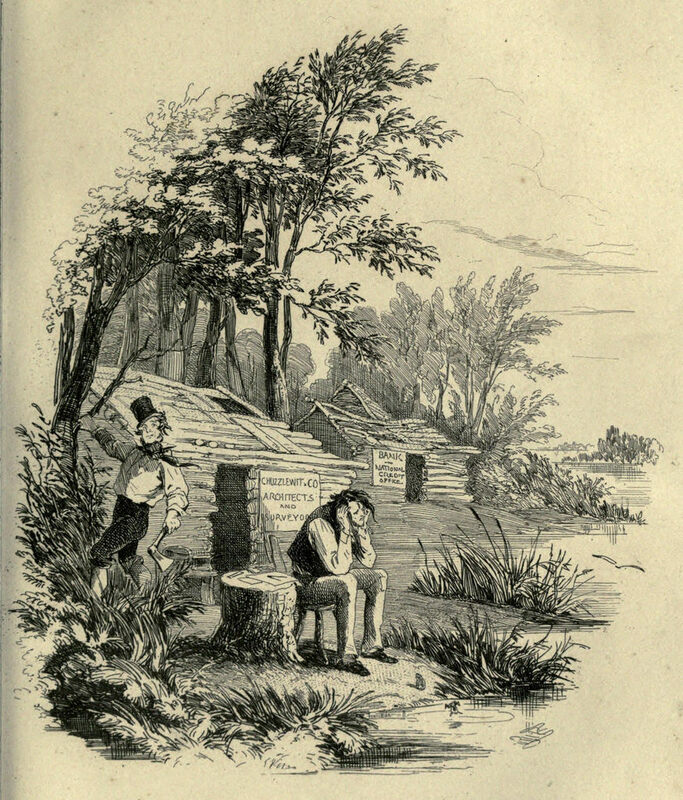 It didn’t help that this man of the prairies not only found the New York literary establishment unhelpful but thought New York itself an unpleasant place, calling out its “endless roar and hurry” and “seething whirlpool of struggling humanity”. Donnelly tried to fight back, damning the arbiters of American science as pedantic schoolmasters who parroted the orthodoxy of European experts rather than look to new creative ideas. “Neither will an American Scientist accept any American thought until it has the brand of foreign approval”, he lamented in his diary. A third book that claimed to find cryptograms by Francis Bacon hidden within Shakespeare’s Henry IV met another chilly reception (“mountebank” was one reviewer’s judgment on the author). “My book is a failure, and my political prospects are dark”, he grieved in July 1888. A few months later he let his manic side loose: He ran for governor of Minnesota but dropped out part way through the campaign, lost an election to the state legislature that was supposed to be a sure thing, and put his name forth as a sadly hopeless candidate for US Senate. The day after his senatorial bid failed, Donnelly began work on his second bestseller. He had ended Ragnarok with a tacked-on assault on the evils of capitalism and its tacit belief that “heaven is only a larger Wall Street, where the millionaires occupy the front benches”. Caesar’s Column, which appeared in April 1890 from an obscure Chicago publisher after New York houses wouldn’t touch it, took the ills of capitalism head-on. It sold an impressive sixty thousand copies in nine months, gained three English editions, and was translated into German, Swedish, and Norwegian. Donnelly turned Brace’s fears into fiction. 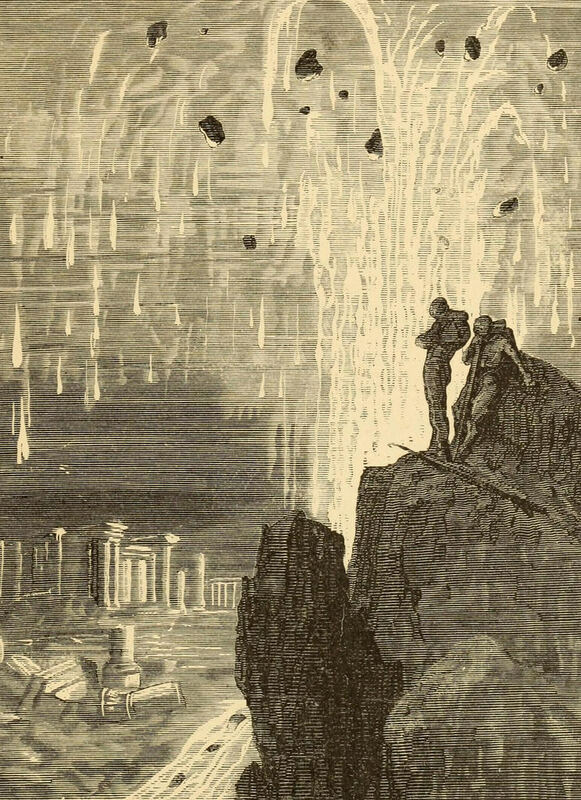 Caesar’s Column was proto–science fiction rather than pseudoscience. It follows the standard utopian/dystopian trope of a visitor from afar who records his experiences and observations. In this case the visitor is Gabriel Weltstein, a wool merchant from the peaceful white society of Uganda who travels to New York by airship and writes a series of letters home. He finds a technologically advanced city with subways under glass, televised newspapers, and unlimited electricity tapped from the aurora borealis. He also finds a city deeply riven by class divides. Through accident, he falls under the guidance of Max Pelton, one of the members of the Brotherhood of Destruction, who shows him the immense inequality engendered by the oligarchy that rules the United States. “Burn em up,” said Caesar. “Heap em all up in one big pile,” said Caesar. Caesar was standing unsteadily, looking at us with lackluster eyes. Suddenly an idea seemed to dawn in his monstrous head — an idea as monstrous and uncouth as the head itself. His eyes lighted up. 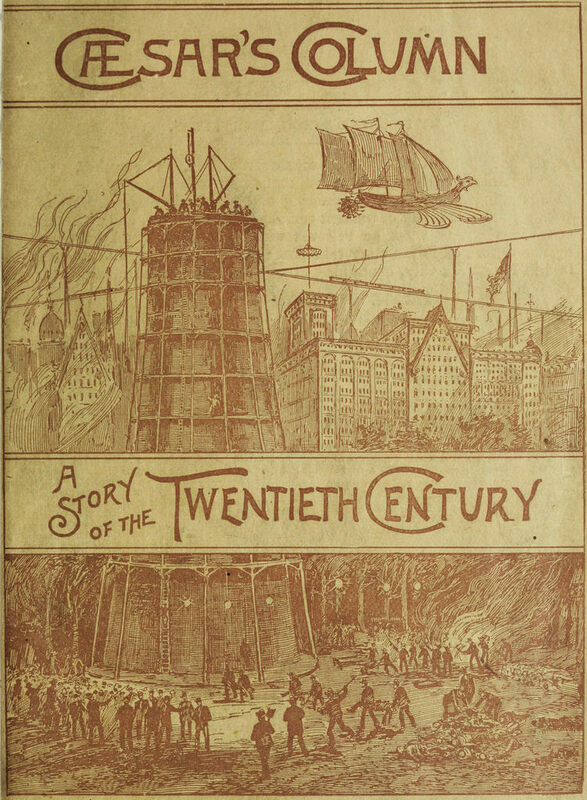 As New York plunges into the fires of revolutionary destruction, Weltstein escapes in an airship to the highlands of Uganda, where white men and women have another opportunity to build a simpler and more equitable society — Donnelly’s effort to reimagine the hopeful white settlement of early Minnesota. 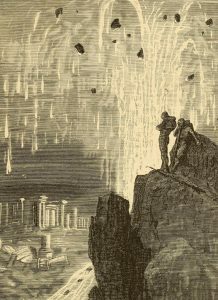 Caesar’s Column was the high point of Donnelly’s career. He continued to write for another decade, turning to parables and political tracts that found few readers. He ran for vice president in 1900 on a ticket splintered from the waning Populist Party — getting one vote out of every three hundred. With his facile pen and taste for the extreme, a reincarnated Ignatius Donnelly would flourish today as an Internet blogger. He would be quick to spin calamities into conspiracies and tweet dire predictions about national collapse and global chaos. Perhaps fortunately for us, he remains stuck in the nineteenth century, a man who had to make do with pen, paper, and his own imagination of disaster.